People wish for better lives than they have. Our aspirations follow the direction of our culture's ideals. These aspirations and ideals are presented most powerfully and beautifully in advertising. A compelling ad injects feeling into us: I want to be that! Ads triumph through design and execution. No part of an ad photo is an accident, it all has to contribute to the desired effect. Advertising agencies ensure the quality of their work by throwing the best minds at an image, and a unbelievably large amount of money, more than any artist could afford. This beautiful photo of a girl with her bicycle illustrates what I'm talking about. 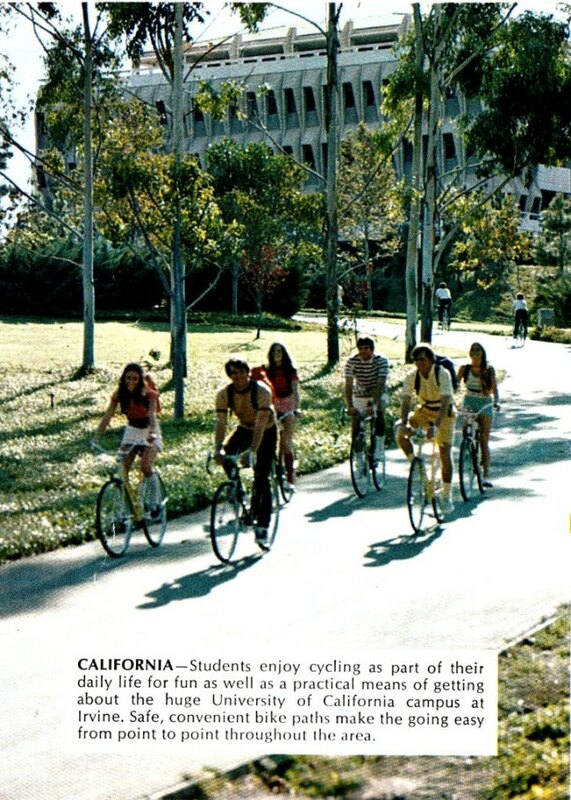 If you just glance at it, it looks like a photo you could take yourself, on an afternoon bike ride. However, this impression is entirely false. This photograph is the result of precise staging. It required big equipment and several technicians working together. A large artificial light was placed to our left, so that the girl and the bicycle would not appear in shadow, the sun being behind her head. 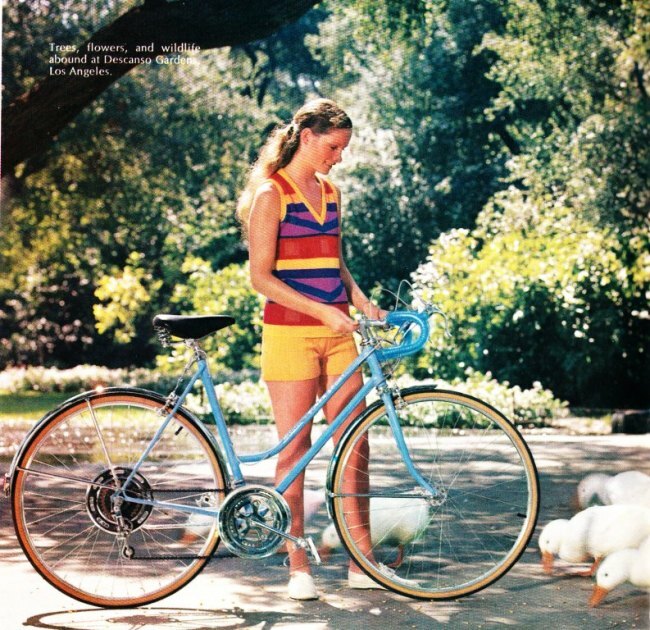 We can only imagine the effort required to coax the ducks close enough to the bike so their cute parts were photographed, but not their duck-droppings, which surely existed off to the right. Of course, the girl herself had to be beautiful, hair just so, and the bike shiny. 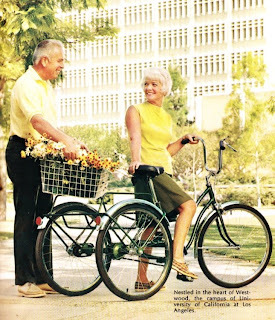 Again, we don't want the bicycle for itself, but because it's close to her, in a prettier world. 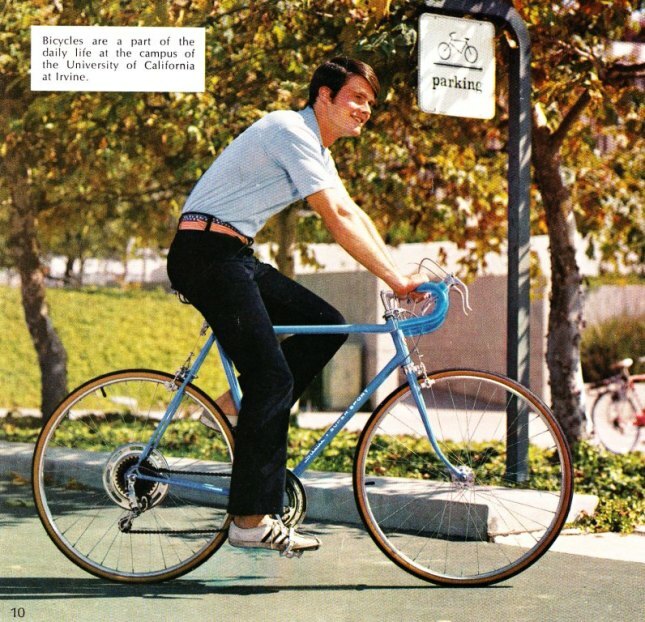 These images come from a Schwinn catalog, published in 1972. You can see the whole thing here. The photographs were shot in southern California. It looks heavenly, doesn't it? When I saw this catalog, I was living in Texas. If I'd had a choice, I would have packed a car and moved right away. 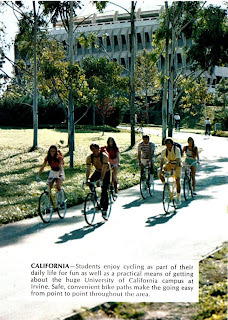 Life in California—drenched in sunlight, populated with healthy, happy people—is the big product here. If we can't move, maybe we'll get a little of this magic if we buy a Schwinn bike. What single girl wouldn't want to jump into this picture? This is my favorite page. It's another vision of Heaven and every inch of it is set precisely to convey the message: If you're old, you can stay healthy and pursue romance on this adult-sized tricycle. 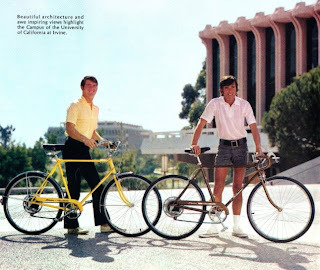 I'm beginning to look like these people now, so it may be time for me to buy one.